Hanging plants create a special look anywhere they are displayed. They show off color and attract the eye. They enable you to increase your plant collection by giving you more room. When choosing plants for hanging look for species that have vines or a draping nature. Some plants to consider are fuchsias, geraniums and spider plants. Choose a container that is twice as deep as your plants. Make sure that there is a drip catch tray. This prevents the mess of water running through your plant and helps conserve moisture. Mix 1 gallon of peat moss with an equal amount of perlite. This creates a lightweight soil mixture that drains well. Fill the hanging basket half full of your soil mixture. Do not compact it at this point. 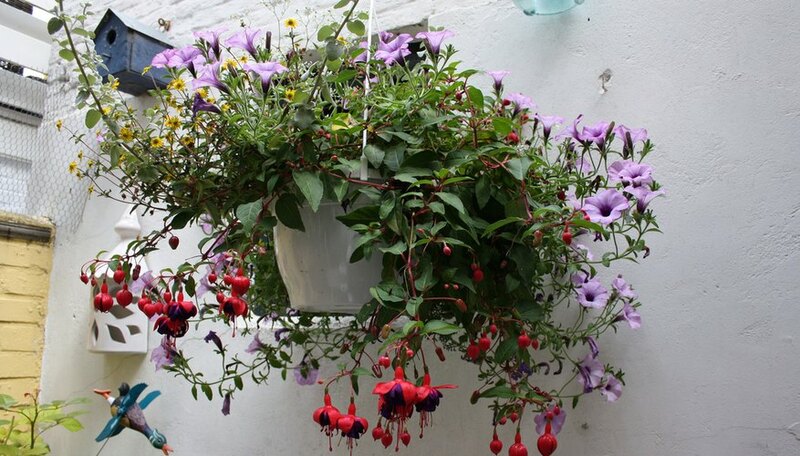 Remove one of your plants from its container, and place it halfway between the edge and center of your hanging basket. Place each of your plants this way. Be sure that the plants are going to be 1 inch below the rim of the hanging basket to allow room for water. Fill dirt in around the plants. Gently compact the plants down. Cover the root ball tops. Water the hanging basket with 2 to 4 cups of water. Hang the baskets where they receive full to partial sun—preferably on the south or east side of your home. Check that the sun isn't blocked by overhanging eaves or trees. Check the soil daily and water as needed to keep the soil moist. Water up to two times daily during hot, dry spells as strawberry plants in hanging baskets dry out more quickly than strawberries planted in the ground or in on-ground containers. Fertilize weekly with a liquid balanced fertilizer. Mix the fertilizer with water according to label instructions for your basket size. Fertilize only during the active growing season and not after plants go dormant in winter. Remove runners from the plants as they form. Cut them off where they emerge from the main strawberry plant. Runners look like stems growing along the the top of the soil or trailing over the basket edge. Choose a hanging basket. Basket options include wire or wooden open baskets and fiber or plastic closed baskets. Select a hanging site that features a support structure with a hook for the basket. Locate an area with partial shade indoors or indirect sunlight indoors. The ideal temperature for Madagascar jasmine is 70 degrees Fahrenheit during the summer and between 55 and 60 degrees in the winter. Add 1 inch of gravel to the base of a plastic basket to help with drainage. For wire, wooden or fiber baskets, instead add a basket liner made from fiber or foam. Sphagnum moss is also an option if it includes a polythene lining to prevent dripping. Fill the basket with a rich, well-drained potting compost. Press the compost down by hand. Plant the young Madagascar jasmine vine in the center of the basket, at its original depth. Water the plant thoroughly. Continue watering one to two times per day if not using a basket liner, and half as often if a basket liner is present. Fertilize the plant six weeks after planting with 1/4 cup of high-potassium liquid fertilizer. Prune away any weak growth in the late winter with pruning shears. To control the size, cut shoots no shorter than 3 inches in length. Plant amethysts in neutral to strongly acidic soil. The plants require a pH ranging from 5.1 to 7.5 to thrive. Feed the flower with fertilizer or compost once it starts to bud. Don't overfeed because too much fertilizer will cause fewer flowers to bloom, despite having lush foliage. Give amethyst a half day in full sun, then move to the shade during the afternoon sun to achieve the most colorful blooms. Focus on keeping the soil well drained. Amethysts aren't too fussy about the type of soil, as long as it drains well. Dig up a few plants about six to eight weeks before the first frost. Cut them back and put them in pots as indoor plants. Place the pots in a sunny window. Expect flowers all winter. Fill up the base of your basket with wadded or shredded newspaper. The basket should be filled about two-thirds of the way to its top. This gives you a good base for your basket. Cover the newspaper with your colored shred. Spread it around to cover the newspaper completely. Tier the gift items in the basket. Stack the tallest items, such as bottles of champagne and bubble bath, in the center of the back of the basket. Place the other items around the tallest item. Use clear, invisible tape to bind the items together. This keeps them from shifting while you finish wrapping the basket. Add any additional shred you need to keep the Valentine's gift items in place. Sprinkle a handful of silk rose petals for a pretty finishing touch on your basket contents. Open the cellophane bag and place the basket inside. Ask someone to hold the bag open for you as you tuck the basket in without shifting the items too much. Pull the sides of the cellophane bag up and gather them with your hand. Use a rubber band to secure the bag. Tie a bow around the top of the bag using some floral wire. Twist the floral wire in the back of the bow and snip the extra edges off with wire cutters. Add a pretty blank gift card to the outside of the basket. This makes gift-giving a little easier for your customers. If you display your basket in a store, add a price tag. Choose any type of container for planting—bucket, pot, hanging basket or planter—as long as it has drainage holes in the bottom. Consider the types of materials containers are made of and their impact on watering; for example, a plastic pot will require less watering than a clay pot. Use regular potting soil for smaller pots and hanging baskets. Use a soil-less, lighter-weight mix for larger containers. Make sure the soil is well drained and rich in organic matter. Amend the soil by adding a slow release fertilizer, mixed according to the manufacturer’s instructions. Avoid using garden soil as it may be infested with garden pests. Start tomato seeds indoors in early April or buy already started plants in May. Purchase varieties that will grow well in containers. Consider the Florida Basket, Micro Tom or Anmore Dewdrop for hanging baskets. Plant Tiny Tim, Totem or Yellow Pygmy in small pots. Place a tomato stake or cage in the container. (Hanging baskets do not need cages.) Add soil mix to the container, filling it three-fourths full. Place the plant near the stake and add soil mix around the plant. Water the plant thoroughly. Put the container in an area where it will receive six to eight hours of sunlight. Fertilize the plant once a week with a soluble fertilizer with a 15-30-15 ratio. Water the hanging baskets thoroughly immediately before you fertilize to ensure that the potting soil is saturated. If you fertilize the plants when the potting soil is dry, you risk burning the sensitive roots of the plants. Allow the water to drain from the bottom of the baskets before you proceed. Mix the fertilizer with water in the watering can, according to the recommendations on the label for the size of your hanging basket. Pour the fertilizer over the soil in the basket. Do not allow the fertilizer to splash onto the plant foliage as you pour. If fertilizer does splash onto the foliage, wash it off immediately with plain water. Fertilize hanging baskets every other week with the water-soluble fertilizer throughout the growing season. Amethyst flower, as the name implies, is a bluish violet. The blooms contrast well against the green of the leaves. Seeds should be used for propagation, without cover, in the early spring. Watering should be from below the pot or tray, transplanting to their new location when they are hardy. Compost can help nourish the plants but don’t overfeed with additional fertilizers or you’ll only get leaves without blooms. A simple 1/2 inch or so of compost added to the soil will work well. Amethyst flower needs full sun for part of the day and isn’t well suited for windy environments or cold climates; it is not particular about soil type. It will grow to about 12 inches high, 8 to 12 inches wide. Before the first frost, about six to eight weeks prior, dig the plants up. Repot them inside and cut them back drastically. Putting them in a sunny location indoors will insure flowers all through winter. Choose a hanging basket or container for your bacopa. Drainage holes are essential, regardless of the type of container material. Line the hanging basket with sphagnum moss to ensure a proper balance between drainage and moisture retention. Prepare a potting soil mix by adding slow-release fertilizer at the manufacturer suggested rate, incorporating well for optimum food availability over time. Fill the container with soil, leaving 1 inch of room at the top. Fill hanging baskets by firming the soil in the bottom and then up the sides of the container, allowing 1 inch of room at the rim of the basket. Squeeze the bacopa seedling from its pot, gently sliding it into your hand. Loosen the roots and plant the bacopa with the roots just below the surface. Cover the remaining inch with soil and firm. Water the bacopa well, and keep the soil moist throughout the summer. Blooms will wilt and drop if you don't water regularly during the hottest months.